This walk: 2014-8-7. 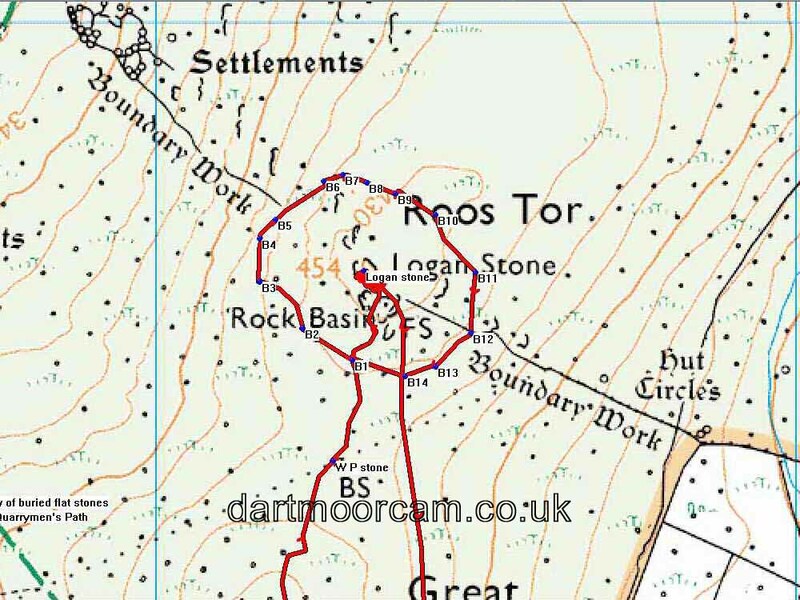 Little Staple Tor, Middle Staple Tor, Great Staple Tor, Great Mis Tor, Shillaford Farm, Cox Tor, Walkhampton / Peter Tavy parish boundary stone, Duke of Bedford marker stones, Roos Tor, Fur Tor, sett maker's banker, explosives store. 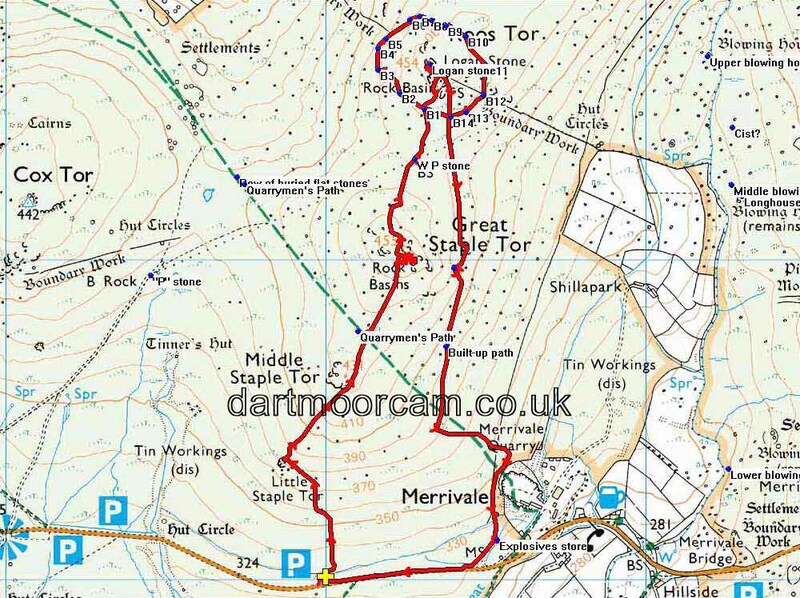 Previous walks in this area: 4th January 2009, 3rd November 2010, 29th Feb. 2012 & 11th June 2014. Approaching Little Staple Tor, SX 5386 7536, elevation 380 metres (1246 feet), with an interesting feature in the foreground that looks almost manmade, a stone "balanced" on two small ones? Rock pans in the top of Little Staple Tor - note the perforated rim near bottom right. View from Little Staple Tor with Leather Tor (left, dark "pimple" just below the skyline, Sharpitor and the rounded, smooth-looking Peek Hill (right). Female whinchat, summer visitor - click the right arrow on the photo to see the female. The twin pillars of Great Staple Tor seen on the skyline from Middle Staple Tor. Zoomed view to Great Staple Tor, SX 542 760, elevation 455 metres (1492 feet). Summer cloudscape over Cox Tor, SX 530 761, elevation 442 metres (1450 feet), not an easy form, looks a bit like cirrocumulus stratiformis? Is it high enough, 16,500 to 45,000 feet, or is it a form of low-level cirrostratus? Pick the bones out of that! Looking ahead to Great Staple Tor. One of the Great Staple rock piles. Another look back at Middle Staple Tor. Looking down on Shillapark farm from Great Staple Tor, during a coffee break. Great Mis Tor, SX 563 769, elevation 538 metres (1765 feet). Could this be a logan stone, if not now then in the past or in the future? Zoomed view to a Walkhampton / Peter Tavy parish boundary stone. Approaching Roos Tor, SX 543 766, elevation 454 metres (1489 feet), with Firing Range flag pole on the right and a logan stone just left of centre. As previous photograph, zoomed view. The other side, showing "P" for Peter Tavy and with Great Staple Tor behind. Looking back at Great Staple Tor. Approaching Roos Tor, with one of the Duke of Bedford marker stones ..... there are fourteen of these around the tor marking the limit inside which the taking of stone in former times was forbidden ..... the markers and bound stones are described by Dave Brewer (2002) Dartmoor Boundary Markers, Halsgrove, p. 251, complete with a sketch map. The accuracy was � 3 metres. 11th Duke of Bedford (1858-1940). apprently never an MP. Their years of tenure of the title can be seen HERE (coloured red). The similar Pew (Pu) Tor markers were cut in the years 1847 & 1896, during the lifetimes of the 7th and 10th Dukes (if they had anything to do with the Pu Tor markers). I have not ascertained when the Bedford stones shown above, around Roos Tor, were installed. It appears that perhaps it is / was the top two stones that "rocked"? Foal on Roos Tor calling for its mother. The same road, looking south. The explosives store at Merrivale Quarry, opened by William Duke in around 1879, closed at Christmas 1997. For a photograph or two of the quarry, see 11th June 2014. Distance - 5.94 km / 3.69 miles.